My friend called me the other day. "Grab your camera and get over here!" The biggest and strangest turtle I've ever seen. He was over 12" across. And moss growing on him?! I didn't even know that was possible. He was certainly not the cutest, cuddliest, or fluffiest critter I've ever seen. But he was still created lovingly by God. Col. 1:16 - All things were created by Him and for Him and in Him all things hold together. His face looks so cute and i don't think i knew, (or had ever thought about) that turtles had tails! I wonder if he is very old? What wonderful pictures and how lucky you were to see him..They are a beautiful fingerprint..
Oh my goodness! I didn't know they could grow a garden on their backs. Think if we could do that! that turtle is awesome! i love the moss on the back of it, it looks like it's in the middle of the road (so random). did you know mr linky says "if you are participating in announcements galore..."?? not sure what announcements galore is. That turtle is awesome and BIG! I don't think I have every seen a turtle that big. Great pictures! That is the coolest thing I have ever seen!! And your photography skills make it look like it's real right infront of me! AMEN! God's creation is amazing! I have to show my hubby this picture. He stops any time he sees a turtle crossing the road. He gets out, picks it up and puts it out of the way of danger. That is the coolest! He is so awesome! You could use him for a metaphor in so many ways! I especially am thinking of being so old and being around so long that moss grows on your back, but we must keep moving and there is living to do! I love it, thanks for sharing! She looks like a walking pond!! Beautiful! This is the day the Lord has made let us rejoice and be glad in it! In todays world it's great to know that people can look around and be amazed over such small and wondrous (and evern weird)creations and know that He exists, even in the little things. Especially today in the trying times we live in. We really do have so much to be thankful for! Gotta say the turtle is freaking me out a bit. I mean, just how slow does a turtle have to move in order to grow moss? Poor thing. Oh my goodness, that is amazing! His camo is grown right there on his back!! Amzaing! We are so hot and dry we don't find turtles or frogs here usually. Lizards occasionally. I love the moss on him. That's an awesome turtle and he looks like he has been places in his life... slow and steady, catching the "small" things in life! I love it! He looks like he's doing the downward dog yoga stretch on that second pic. What an interesting turtle. What a neat turtle. I've seen my share of them, but never with moss growing on it. Thanks for sharing! Wow, that's an amazing photo. I never saw any moss in Kansas while I lived there especially compared to WA state, much less growing on a turtle's back. Great fingerprint! I have never seen anything like him! The moss on his back is very strange! But since I adore turtles (hence my business name!) I love him! He seems like a survivor! WOW!!! That is TOTALLY amazing!! I do wonder how old he is!!! THAT is amazing!! And your photos are wonderful! Wow! 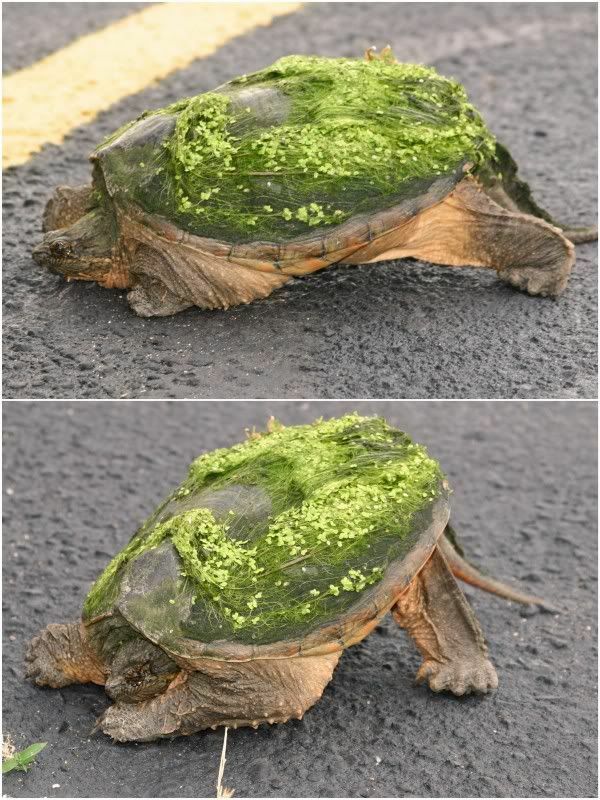 I've seen moss growing on turtles' shells before, but never that long. Usually it's just a slight green film. That looks like a living Chia Pet!